Coming off the back of a five-nil walloping from Bayern Munich, Arsenal were nothing if not prepared when they faced off against Lincoln City in a must win match that would see them through to the semi-finals. As predicted Arsene Wenger named a full-strength side to face off against the so-called minnows of the FA Cup. For Wenger, it was more of a case of pride and damage control than anything else. Lincoln City had already toppled two second-tier sides and a Premier League team to earn its place in the quarterfinals at one of Europe’s biggest football clubs. Arsenal were well aware that a huge chunk of the 60 000 plus fans in the stadium were backing the national league side who became the first non-league football side to reach the FA Cup quarterfinals in 103 years. Outside the grounds, another mini-protest was underway with fans calling for the removal of Wenger, doing nothing for his confidence within the stadium. Despite having a stronger, more experienced side, Arsenal appeared to be on the back foot from the kick off. Early on in the game, Lincoln were the ones who almost took the lead when Nathan Arnold sent a cracking left footer into the top right corner of the post requiring an equally brilliant save from keeper Petr Cech. It was only after 40 minutes of play that Arsenal were finally able to break down the defences of the spirited Lincoln City side with Theo Walcott finding the back of the net in the 45th minute. Having settled the nerves of the team, Walcott opened the gates for Oliver Giroud to strike early in the second half. Arsenal’s run of goals was extended when Lincoln captain deflected the ball into his own goal given the men in red a 3-0 lead. Alexis Sanchez soon added another with a curling beauty from outside the box. Just three minutes later, Ramsey added the fifth and final goal to book Arsenal a place at Wembley Stadium. 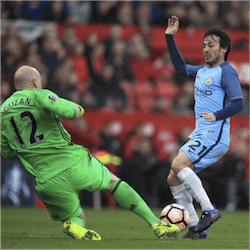 In other quarterfinal matches, Manchester City booked their spot with a 2-0 win over Middlesbrough. An early goal by David Silva and another by Sergio Aguero was all that was needed to make it through. For Tottenham Hotspur, a massive 6-0-win over Millwall saw them sailing through to the semis while Chelsea pulled off a close 1-0 win over Manchester United to complete the teams.